Salmon is a great source of omega-3 fatty acids, which have been shown to help reduce inflammation in the body, keep cortisol from spiking, and boost mood. If you’re new to cooking with fish, or are looking for easy recipes to incorporate more salmon into your diet, this is a great one to try! This recipe uses a few simple ingredients, minimal prep and cooking time, and pairs well with a simple side salad or roasted seasonal vegetables. In order to get the most benefits from your seafood, be sure to look for wild-caught whenever possible and consult the Monterey Bay Aquarium Seafood Watch guide to see which seafood is best in your area. Lay salmon flat on a sheet pan. 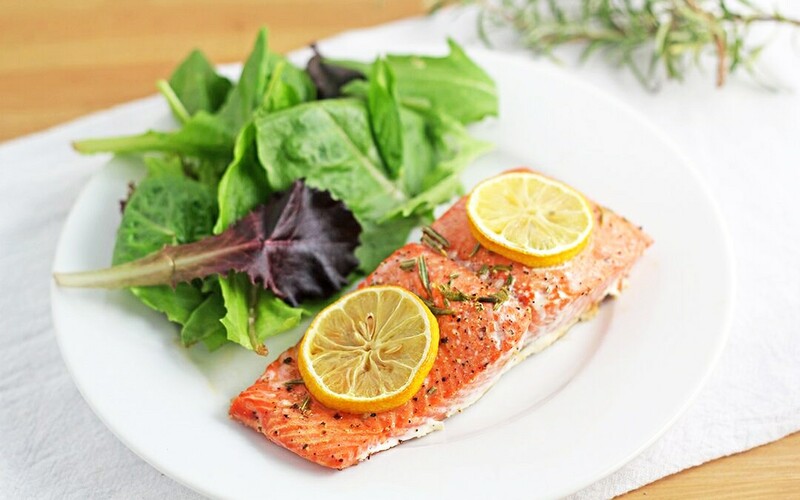 Pour lemon juice over salmon, then sprinkle with salt and rosemary. Add lemon slices over the fish, then bake for 15–20 minutes, until the internal temperature reaches at least 135 degrees F.